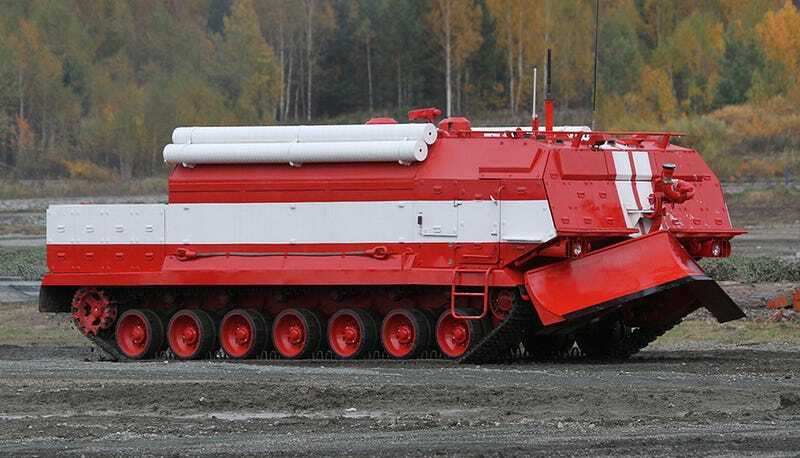 Russia’s innovative “Special Firefighting Vehicle” is being thrust into operation with the Russian Army. It will supposedly go where no fire truck or human can and will be assigned missions including everything from search and rescue, to putting out fires at weapons depots, to creating fire-lines for forest fire infernos. According to the Kremlin, the unique vehicle, which first appeared at a Russian arms expo in 2013, will be first deployed to the manufacturing and transportation hub city of Omsk in June. It will then be rolled out to troops in greater numbers later in the year. The tank, which is often referred to as a robot by the Russian press, weighs 60 tons and is said to be made up of components from both the T-72 and T-80 main battle tank. Although the robot premise is intriguing, the truth is that this vehicle is more of an optionally manned system than a robot. Still, the idea of such a vehicle really does make sense, especially at military bases where fuel and high-explosives are stored in large quantities. Russia’s ammunition storage techniques are not known to be of a very high standard, so for firefighters tasked with protecting these volatile sites, a tank may be a very welcome tool as even small fires can turn into massive secondary explosions very quickly if left unchecked. The Special Firefighting Vehicle is operated by a crew of three and it can be driven normally through its thick glass windows, by remote camera while buttoned down with its shutters closed, or by remote control for especially volatile missions where its crew needs to vacate the vehicle completely in order to deal with the situation safely. Remote control is possible via a set of close circuit cameras mounted around the vehicle, as well as a 360 degree viewing mast that can be raised high above it. This mast also packs a thermal camera so that the tank’s crew can locate fires that are not visible to the naked eye. This is especially helpful when fighting fires in urban environments. The tank carries 25,000 liters of fluids that is can spray through a variable spray pattern and articulated monitor located at its front and it also uses its internal water capacity to constantly spray the ground around it via a built-in sprinkler system. This cools the tank’s drivetrain and hull when it is surrounded by fire. A special environmental control and filtering system is installed that allows the crew to breathe while surrounded by smoke and toxins and special suits are also included that can sustain 15 seconds of being exposed directly to open flames. Because it is a tracked vehicle, it can go where many wheeled vehicles can’t and it can self deploy over 250km on a single tank of gas if need be. Considering that this thing is a firetruck that can basically go to war on the front lines, being able to wheel itself into battle over long distances is a pretty phenomenal capability to have. As far as armor goes, it can take a hit from an high-explosive 155mm artillery shell that lands less than a dozen feet away. Such an occurrence would leave a standard firetruck or even a crash truck a fiery mess and most light APCs immobilized if not destroyed. Although tracked firefighting vehicles are available from various manufacturers all around the world, they remain a niche capability. This is somewhat puzzling when you consider how limiting a wheeled vehicle’s mobility can be during the aftermath of a huge disaster. You would think that airports and especially communities where earthquakes are prevalent, or ones where volatile manufacturing plants and storage facilities exist, would seek similar capabilities as what this vehicle offers. Yet from what I can tell, few similar vehicles exists, especially in the US. Some police forces have M113s and other tracked armored personnel carriers for their SWAT teams which also usually have search and rescue as secondary mission, but none of them are nearly as highly optimized as Russia’s Special Firefighting Vehicle. Russia and the ex-Soviet satellites have been pretty creative when it comes to firefighting and disaster response vehicles in the past. Russia showed off its truly unmanned firefighting mini-tank a couple of years ago, and multiple firefighting vehicles based on existing tank and APC chassis have been produced in small numbers by various ex-Soviet states over the years. Yet none of these designs packaged all the relevant capabilities that the Special Firefighting Vehicle does and most seemed somewhat clumsy or crudely adapted at best. If anything else, Russia’s unique take on a certain problem sets, such as firefighting and rescue operations under the worst conditions possible, should allow us in the US to rethink our approach to similar problems. Could our military and civilian fire services use a tank-like fire fighting vehicle like what Russia is putting into service? Possibly, and some may argue that they make a lot more sense than some of the MRAPs and other surplus military vehicles that the police are deploying fairly large numbers these days. Like the Beriev 200 jet-powered firebombing flyingboat, sometimes Russia does come up with superior solutions than what America has to offer. Sadly, it seems like we never like to admit it. But even if we were open to solutions like Special Firefighting Vehicle, under the current geopolitical realities we could not import it if we wanted to, and something tells me that producing a similar concept indigenously would end up being way more complex than it needs to and costing way more than the Russian alternative.